Some of the community garden volunteers whose shed was broken into. A Midlothian charity has been left counting the cost after heartless thieves stole hundreds of pounds of gardening equipment. 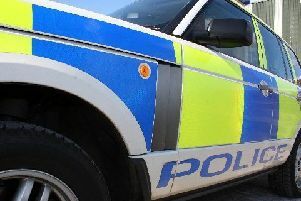 The items were taken after a shed at the Midlothian Community Hospital Garden in Bonnyrigg was broken into overnight recently and volunteers made the discovery when they arrived for one of their usual morning sessions. Around £300 of power tools had been taken, although the group’s lawn mower seems to have been too big to be taken so was vandalised by having its cables cut. The garden is run by the Cyrenians, in partnership with NHS Lothian, and was established five years ago. Since then the local community has committed to its continued upkeep and success with around 25 regular volunteers working on it year-round. Elinor Leslie from the Cyrenians, said that it could cost around £600 to repair the damage and to replace the lost equipment. She said: “We arrived to find that someone had broken the padlock and taken the only strimmer we had, as well as other power tools, and the mower had been damaged too. “It’s the first time this has happened and it’s really upsetting for the volunteers, many of whom have been with us for along time. It’s like someone breaking into your house. Elinor said that the garden has become a popular resource for the hospital and wider community since it was established and is used by many groups. It aims to offer people the opportunity to grow food, socialise and become more active. The team also encourages the development of new skills and teaches about the environment through a number of regular workshops, courses and events which are open to all, with a focus on welcoming people with mental or physical health problems, disadvantaged, isolated or in poverty. It is open three days a week and anyone can volunteer on a drop-in basis. Elinor continued: “It has been developed to engage the community and it helps to give people a sense of purpose as well as having a social side and helping to tackle loneliness and our volunteers here have been really committed, compared to some other places where they come and go.